The cookie tree (arborem magiam crustulum) is a complex plant and has a variety of fascinating parts. The stem is made of several smaller veins which act like pipelines to distribute the cookie dough and miscellaneous ingredients to other parts of the plant. About a meter away from the bottom begins the first cookie layer. It is made of smaller, curvy twigs and branches that sole purpose is to hold cookies and wait for them to mature. As you could imagine this layer is extremely fragile and needs to be protected. Such every layer is accompanied by its own protective layer of leaves above it. The protective layer is made of large, broad, thick leaves with a waxy, water repelling surface which can withstand the strongest hailstorms. Their undersides, however, consist of round, lense like glassy patches. Legend says on full moons these patches start emitting an orangish-red glow to provide the cookies with an extra crisp texture. Now you are probably wondering where it would get the ingredients from. This is one of the most fascinating parts of the cookie tree. During its growth the plant creates several small portals to the Cookieverse™ in the big roots right under the trunk. The cookie dough and chocolate, which slowly dribbles out of said portals, gets transported to a hollow chamber right below the trunk. From there the dough and chocolate gets transferred to the cookie layers and made into cookies. Due to the sheer randomness of Cookieverse™ portals, you cannot influence what kind of cookies may appear in any way. I can see big orchard full of them. Was it was influenced by cookie clicker? I really like this pictures! So scientific looking, even if it's a more on the Sci-Fi side. Also, where can one get seeds or saplings of the cookie tree to grow their own? At the current time there is no way to get cookie tree seeds as we (imer corp) are still testing environmental effect. You can, however, sign up to be contacted once we can distrubute said seeds. This is awesome!! Only question is, how safe are these cookies as food? Are there any averse effects to eating them? The cookies are 100% safe as they are produced completely natural and contain no chemicals or the such. Oh. In that case, well done! 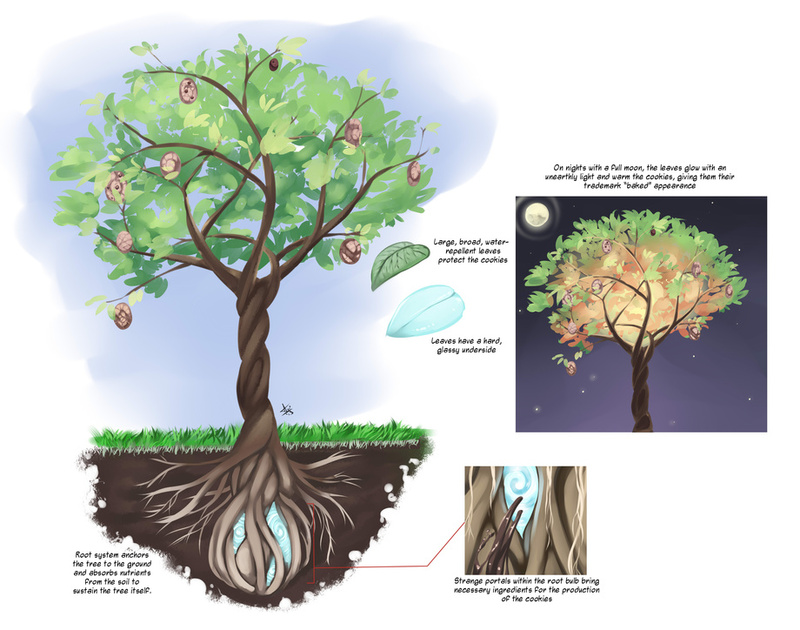 So, I have some similar botany/biology principles regarding extra-dimensional access on my primary story world, but I hadn't thought of making a cookie tree. Do you mind if I use something similar to your design here for my world? If not, I'll do something else. Either way, you've inspired a slightly different use for my dimensional biology/botany. So far, I've only been using it for reproductive cell origin, personal travel, and information transmission. But now, I'm also going to have some plant/animals drawing directly from other dimensions for their nourishment/building materials. If you don't mind me using the cookie tree, I think I'll have it be the favorite plant of one of the major characters for a story I'm writing at the moment. Cool, I think I'll have my deity Sakuraandcherryblossom be the one who created it, just because she likes chocolate cookies. But this slightly annoys the deity Chaka'Toan because hir Shozi species have a negative reaction to cocoa and can't digest gluten, making these trees nearly useless to hir people. But of course, this world also has California Clementine trees which just about everyone loves unless they have a citrus allergy. And yes, even though clementines are an artificially created species which have to be recreated for every generation, on this world the deity Kalkanash made a tree that grows the California genetic line of them perfectly, just because he likes them the best. Anyway, thanks for letting me use these, I'll cite you as the inspiration for my version of them. Though, mine won't be affected by moonlight, as the planet of Xamesh doesn't have a moon. I have now posted my version of the Cookie Tree in one of my Ask Xamesh posts: http://xamesh.tumblr.